Grace from design*sponge shared a great glass jug lamp this morning on twitter. She wondered where she could find the parts to make her own. I’ve been eyeing this project for months. 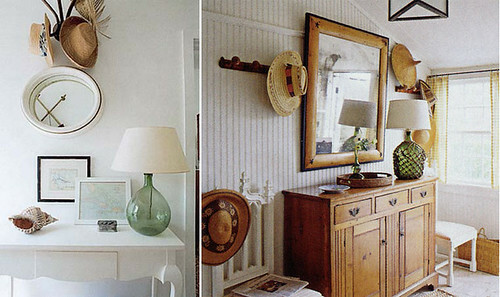 I would love some glass jug lamps scattered all around my house. They feel so nautical and New England. Above is an inspiration shot from Tom Scheerer. 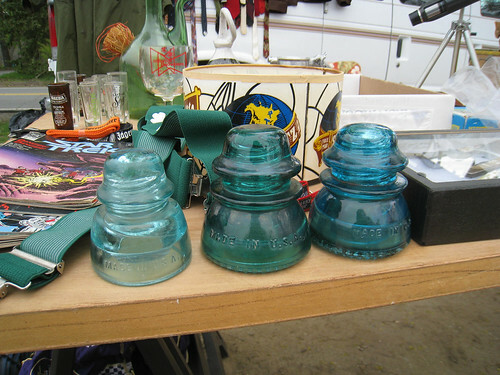 A few glass reed wrap bottles and insulators I’ve spotted at local flea markets below. The jugs are quite easy to convert. You can purchase a cork sockets for around $15, thanks Kate Flaim for the source! Basically you just stick the cork into the bottle and your done. Below an Insulator Night Light Kit for $20. So cute for a small space or hallway. I haven’t found a source online yet for vintage glass jugs. 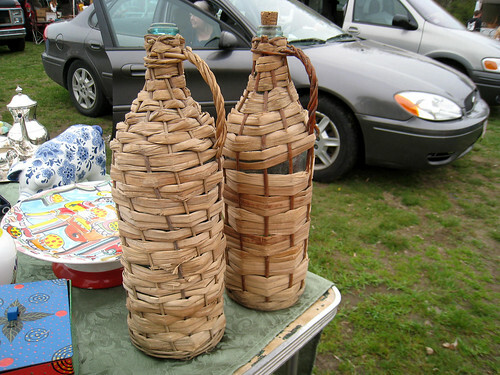 I have spotted them at fleamarkets and antique stores around New England. Do you know a good online source? Leave a comment below. p.s. Anne from the City Sage just gave me the head’s up on a post about unique jug resources on decorology. Very nice photos. I recommend you ebay for buuing and selling antique glass bottles. What a fun project. I'm going to check the thrift store this week and see what sort of jug I can find. Thanks for all the data on this. I saw an article on Blenko glass in the recent issue of Country Living? This one is pretty too from ebay. I don't know about a regular source, but isn't this a lovely one on ebay? Have you tried ebay? I've found ebay to be a great source for anything vintage.